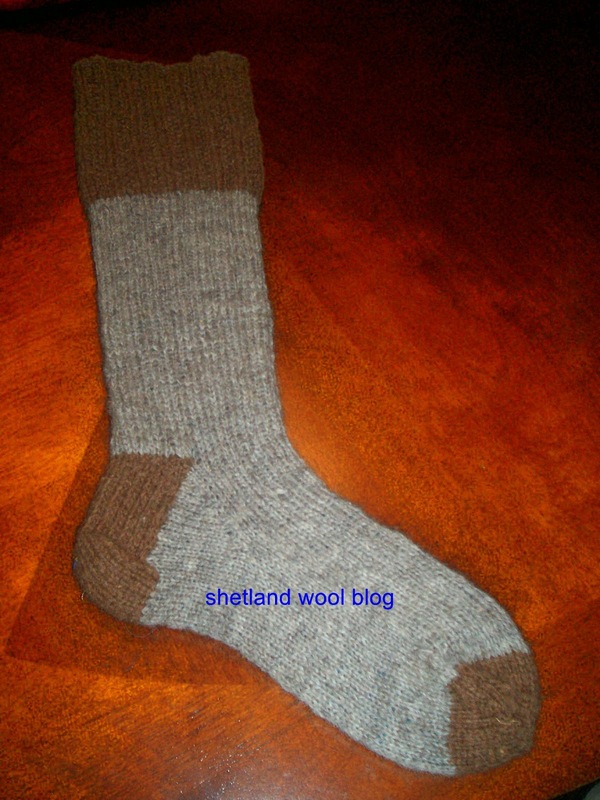 Shetland Croft Wool..... Sock Kit. Well its that time again....snows here and will be with us until about 20th April, it's a very Long Cold Winter here in Quebec ! The sheep dont seem to mind the snow. I leave the door open during the day so they can go in and out. Inside the barn its cozy and dry. The hay mangers are filled and overflowing with the best quality semi-dry silage hay...... they can eat as much as they need to stay healthy and warm. The sheep spend their day frolicing in the snow......me i mind the snow. Inside my rubber boots i like my feet to be Toasty warm and dry so i can enjoy doing my barn chores....there is nothing more miserable than cold, damp feet ! This is made from 100% shetland wool raw fleece that i purchased on the internet. Natural brown Moorit.....it's very soft compaired to regular sheep wool. 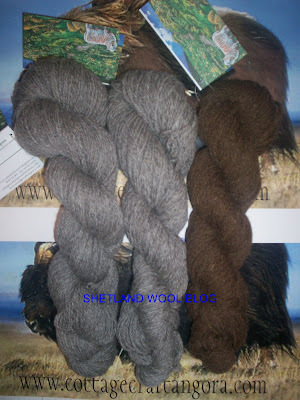 The grey however is not so soft but its still 100% shetland and has a beautiful colour and twist to it. 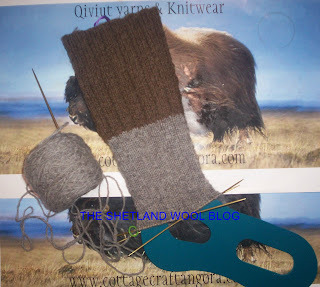 I have always loved sheep wool socks eventhough they are not the most durable. They bring back happy memories for me of the time i lived in the Scottish Highlands back in the 80's and there was always pure wool socks hanging around the 'rayburn peat stove' drying and steaming with the smell of wool in the air. Back then i would knit with only local grown 100% Virgin sheep wool. The Winters were Long and dark with lots of knitting being done by my mother and i. I lived on a Croft with my family and sheep wool socks were the norm for doing winter chores around the barns and checking on sheep laying in deep snow drifts. The socks back then were a lot heavier than the type we all make today. The wool was almost worsted weight.....very heavy for socks but they did the job, feet were warm and dry. I wanted to knit a pair of socks for work so i came up with this and will make them as a kit for the December giveaway. The socks are longer type. Come upto your knee, the top half is knit in 100% shetland Moorit 3ply in a mistake rib (it's difficult to see the mistake rib stitch without stretching the sock top, but its a very attractive stitch). The grey leg section feels like the perfect yarn for these type of socks because its quite close knit and has plenty of twist will stay up no problem and is knit with a k3,p1 stitch = No Drooping. As you can see i'm not quite at the heel yet still a good few inches to go but when i get to that part it will be knit with the Moorit colour. When i turn the heel it will be knit double to help with the durability issues. The foot will be knit in grey and the toe knit in Moorit to finish.....will post pics of finished sock ASAP. One sock done....it was really nice knitting with sheep wool again after all these years. 2nd sock is well underway and i'm looking forward to wearing them inside my rubber boots. And now all the family wants a pair....thought my christmas knitting was finished ! Socks complete and i love them, not only do they keep your feet warm and dry they warm your legs too, they will be quite duarable. The legs length measures 14'', foot length 10''.... i got quite big feet. 70% Shetland-30% angora rabbit.....YUMMIE YARNS ! One winner chosen at random from correct answers. FROM: 01-December-2012 TO 31st-December 2012. 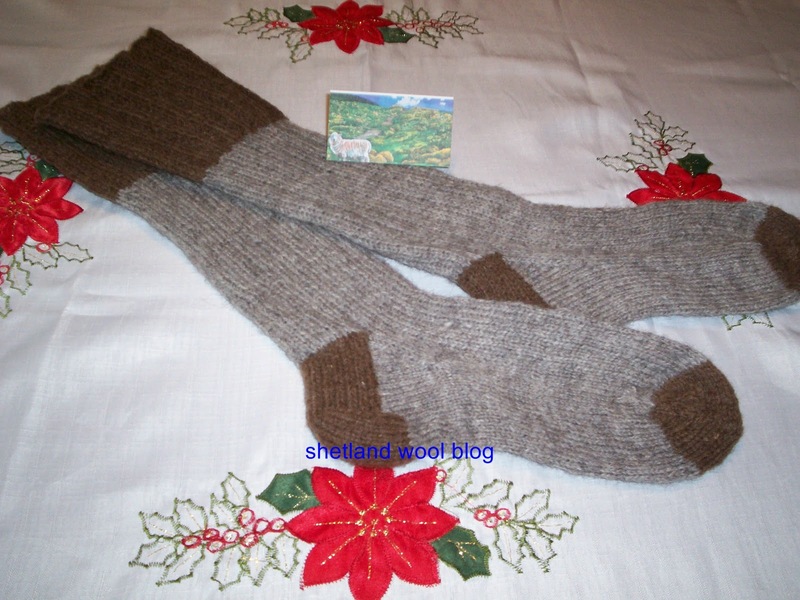 Kit Contains: enough shetland wool yarn to knit a large adult pair of socks and the pattern. ***Please note you will need both 2.75mm and 2.5mm D.P.N's ***Not provided in kit. tell us what is the estimated shetland sheep population of the Shetland islands. Hello, your name was drawn at random.....please send me your details so i can mail you your yarns.....happy new year ! It is currently estimated to be between 70,000 and 80,000 sheep on the Shetland islands! Those socks look great! 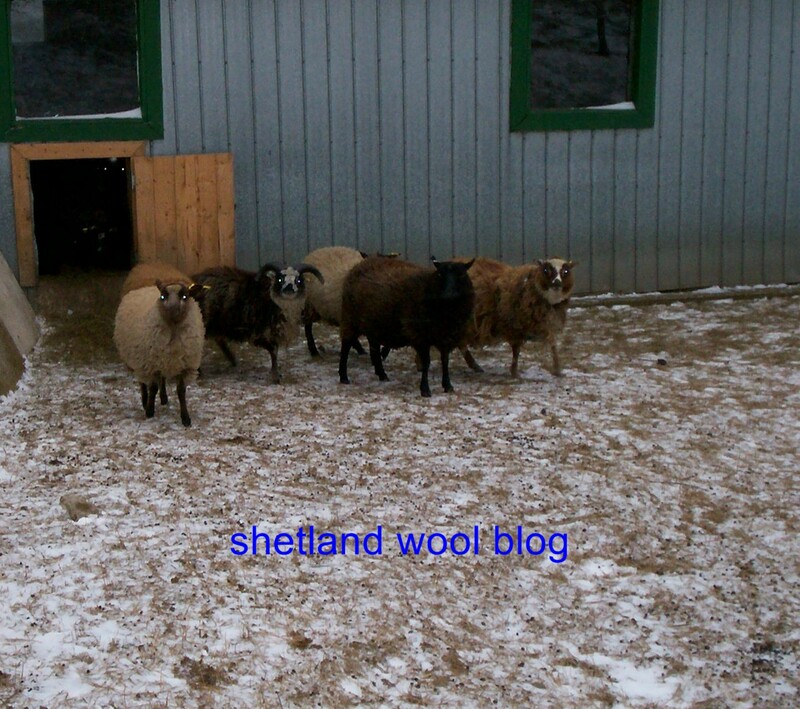 I read that the estimated Shetland sheep population is around 3,000. Present day values are said to be about 150,000 breeding ewes .... so I imagine the overall numbers are higher than that, given that there must be rams, non-breeding ewes, and lambs (according to the Jamieson and Smith website). Interesting that there are roughly 22,000 people and all those sheep! 70,000 to 80,000, though the present day value is closer to 150,000 breeding ewes. According to Jamieson & Smith, "The number of sheep in all the Shetland Islands, is calculated to be between 70,000 and 80,000." Between 70,000 and 80,000. I wish i could go to the islands and see for myself, what a vacation that would be! Estimate of 70,000 to 80,000 sheep in Shetland Isles with approximately 150,000 breeding ewes as of around the year 2009. UK population of over 3000, causing them to rise from the endangered categorization they once occupied. The only info I could find regarding Shetland Isl is that the flock fluctuates & is hard to quantify. Thanks for making me give myself a little tutorial on Shetland sheep! they're nice, just like their wool! My initial guess before Googling was 100,000. Google didn't give me a definitive answer, so I will have to stick with that number! I love that the Shetland Islands were known as the "Isles of Cats". My guess is around 80,000 to 100,000 sheep on the Shetland Islands.